Virginia Beach Vacation Rental. ONE BLOCK to Boardwalk& Beach! 1 block to Brdwalk & Beach! 2 bedroom 1 bath cozy CONDO! We are a family of 4 who loves the beach and being outdoors! We welcome you to Sandcastle By the Shore, and invite you to feel at home!! Our family has always loved the beach and the ocean! When we discovered this little condo, we felt so fortunate to be able to make it our home away from home, right near the water! We hope your family will enjoy your stay and create many happy memories here! LOCATION! LOCATION! LOCATION! Sandcastle By the Shore is only ONE block to the boardwalk and ocean area!! The complex is right on the corner of 9th and Pacific Avenue, on the east side of the street backing up to Atlantic Avenue!! Only ONE block from the Virginia Beach Boardwalk and Beach! View of Lake Holly from bedroom windows. One reserved parking space in apartment lot in front of unit! The 9th street parking garage is conveniently located across the street if an extra space is needed! YES! A nice coffee maker and a tea pot! Oven mitts are left in cabinets. Well stocked with pots, pans and all the extras! Dishwasher, microwave, crock pot and more! A nice sturdy round dining table which comfortably fits 4-5 chairs, but there is 6th matching chair in master bedroom for a squeeze in guest. a few nice paperback beach selections in book case under tv. Look for nice games in enclosed table/ottomon. A few classic toys, etch a sketch, etc. **2nd floor with no elevator. Bathroom door is not wide enough for a wheel chair, but a walker can fit. Perfect place one block from tbe beach! They place was amazing. It is just as described. The location is perfect! 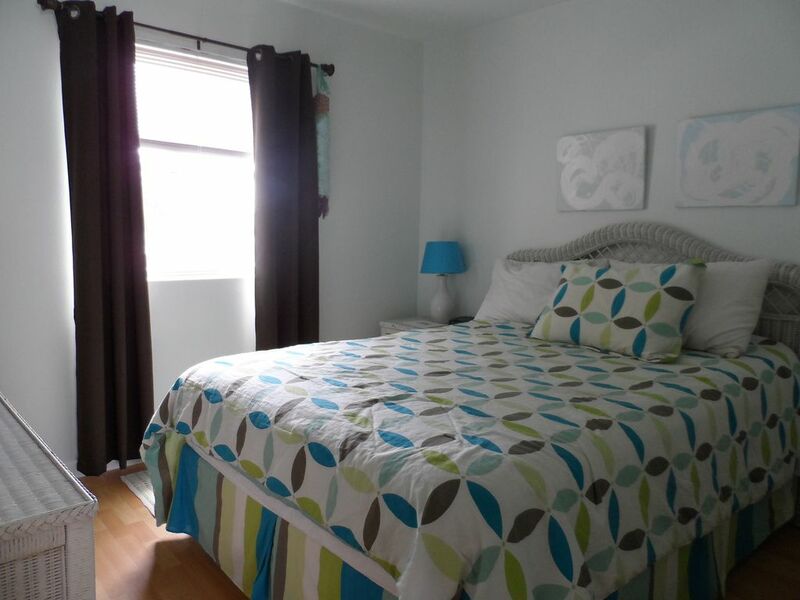 A short few mintue walk to the beach and in a great place to walk the board walk so you don’t have to do much extra driving and paying for parking. Property owner was a pleasure to deal with. She was available when I needed anything. The neighborhood was relatively quiet with the noise being from traffic not loud people. Having the passcode for the door was so convenient because we didn’t have to worry about carrying keys with us or losing them! Over all this place was absolutely great! We will definitely stay here again if we go back to Virginia Beach in the future! Anyone with a small family checking this place out should definitely book this great condo! Located right in the heart of the Virginia Beach resort and boardwalk area! The Board walk, beach & ocean, play grounds, shops, restaurants and art galleries are steps away! Check In is 4:00 pm & Check Out is 10:00 am **Please ask about a low off season monthly rate!